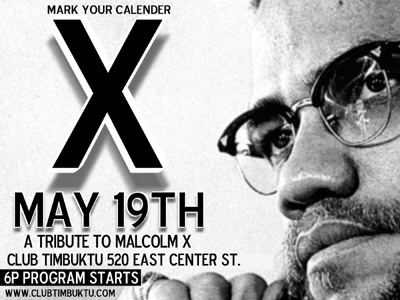 May 19 — 6 pm A Malcolm X Tribute hosted by Gorilla Promotions will celebrate his birthday with a video of a Malcolm X interview, a review of his life and open discussion. Open mic for spoken word poets and performers. Thursday, May 19, 6PM at Club Timbuktu. Gorilla Promotions has recently moved to the heart of Riverwest at 804 E. Center St. They will be hosting a month long series of “May Daze” at the Uptowner on May 3, UPROC on May 14, Onopa on May 21, and Riverwest Commons on May 27. Check the calendar for more details.